Cellphone Diver will be our coming game! It's an upgrade game about Zamenhof diving into harbor for getting back his previously drop phone. The development of the game is still in very early stage. Details coming soon! Website and Trailer are now available! It is currently under development. It is planned to be released any time before the end of March. Zamenhofo Plonĝu estos nia venonta ludo! Ĝi estas pri Zamenhofo plonĝi por irpreni sian ĉeltelefonon el haveno. Ĉi tiu estas la ligilo de ofica retejo de Zamenhofo Plonĝu en Esperanto. Ĝi estos disponebla antaŭ la fino de Marto. Public domain assets pack of the game available at the end of this blogpost! The graphic is done with Inkscape. As you may have known, this game is based on my Ludum Dare 33 Entry. Most of the development time are spent on graphical improvement. This section is about the analysis of the graphical changes. 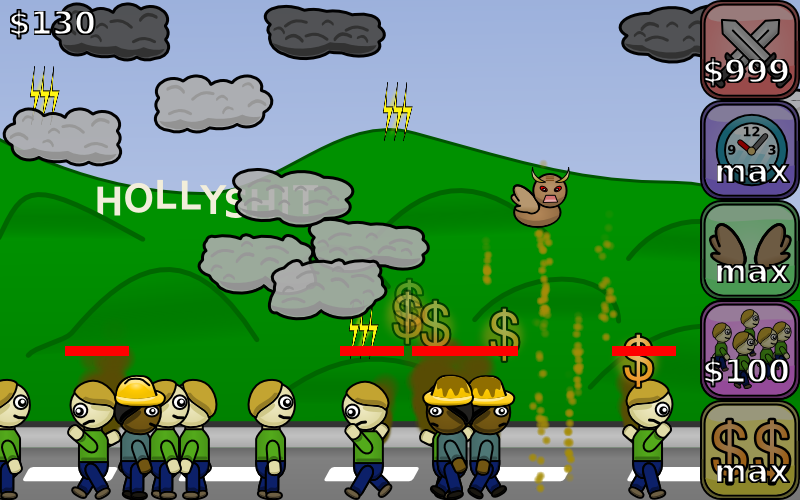 Poopie is the main character of the game. The left one is the original Poopie. The right one is the current one. Compared with the original design, the current design has eyes inclined. The eyes also has eyeball in it. The shading consists of two elements. 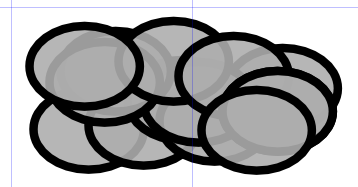 First is that in somewhere above the center of the object, a radial gradient is used to make there a bit brighter. This can make the object looks spherical. 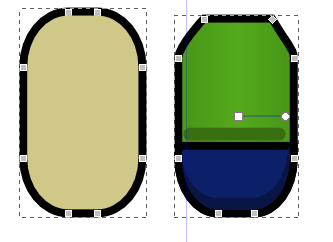 Second is the bottom of the object is shaded with a darker color. This reproduce the reflection and diffusion property of feather skin. It would looks wrong without proper shading. For example, the wing on the top-right is shaded as up bright instead of down dark. It causes the wing looks like a piece of plastic or metal or lolipop. Another example is that if you don't shade it, just like the original version of Poopie, then it would looks like a piece of sheet(pun intended). The shape of the wing is inspired by(a.k.a. stolen from) the number 3 wing from the tutorial here. We got three victims. You probably expected that. The green clothed victim is weaker. The worker victim is stronger because he got a hard hat. Kim Jong Un is the strongest because he's a leader. And for each victim except Kim, their appearance are different after getting pooped. The first head on the pic is the older version(never released to the public) of the head of green victim. After drawing that, I found that it doesn't look right. Especially the hair. It's just weird. Then I realize that the boundary of the hair shouldn't overlap the one of the head. To fix it, I scaled the hair to a larger size. In addition of this, I have deformed the head a bit because human head usually isn't a perfect circle. Notice the bottom node. Its left handle is longer so that the head is deformed. dark shade right below the hair and at the bottom of the head. And that's it for the head of the green worker. A possible improvement is to increase the saturation of the head. It's because it looks too grey. The worker head is just a recolored variant of green victim. I use black color because the workers are usually exposed under the sun for a long time. Therefore, their skin are usually darker than usual. In addition, using black skin can give the game more diversity. That's why a darker skin is used. Similar to the head, the hard hat is shaded. But the top spherical part of the hat shaded bright on the top instead of shaded dark in the bottom. It's because hard hat is made of plastic. Shading it up bright can make a material looks like plastic. In the plane part of the hat, it's shaded bright on the top for the same reason. And it's shaded dark at the bottom so that it can shows the thickness of the edge of hat. For the head of Kim, it's based on the previous version of the game, which is based on this pic. The shape is easy. Just embed the pic into Inkscape. 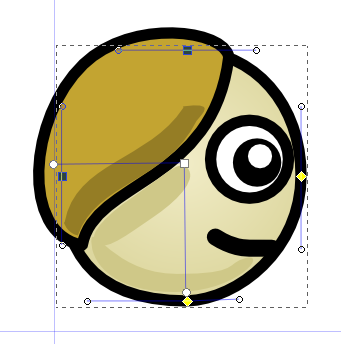 Then use path tool to draw the outline of the head. And that's it. The difference between two version is that the new version is shaded. If you observe the pic carefully, you would found that his hair is semi-transparent on the boundary in the new version. Another difference is that Kim is smiling in the new version because it looks more like him when he's smiling. The shape of the body is a slightly deformed rounded rectangle. By cloning the deformed shape and using the "Difference" function, the bottom part of the body can be colored differently so that it looks like blue trousers when it is viewed together with his legs. The shading is just using similar technique I mentioned before. It's gradient and dark shade at the bottom. For the body of worker, it's more grey to reassemble the dirts in the construction site. The color of the clothes of Kim is just like the color of his clothes when he appears in the public. And Kim is a bit fatter because he is the boss in the game. Being a bit fat makes him looks stronger. The left one is the original police car, while the right one is the new one. The shape of the police car is done by referring a few police car images from Google Image Search. For the shading, I just use similar technique as stated above for shading the police car. Except the windows. It has some translucent diagonal lines so that it looks like glares. The size of the text "POLICE" is reduced because it can increase the area of the paint surface exposed to the viewer. It makes the shading of the paint looks better. For both black clouds and white clouds, four variants are drawn. A random white/black cloud graphic is used whenever a in-game cloud is spawned. It's because the game has a lot of clouds. It would looks dull if every single cloud are identical. After unioning them, draw a tiny straight line. Then make it a curve by dragging it using path tool. Then make a few variants of it and put it into the cloud. Finally, shade it dark at the bottom. That's how the cloud is made. Obviously, the top row is the original upgrade buttons. The bottom row is the new one. Not much to say about upgrade buttons. The new one just added shading. And I've changed the icon of flying speed upgrade. The new one is better because it looks more funny. Poopie literally makes Kim a shithead(for entertainment purpose only, no political message intended). A few graphic enhancement was also done. 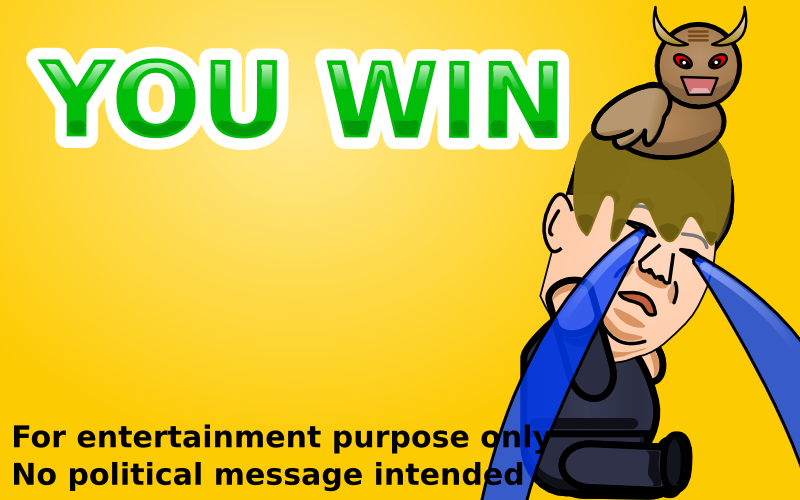 It includes the text "You Win". The new one is shaded like that it's made of glass. The tear steam also has a little bit shading. And most importantly, the new Kim looks much better than the stick man Kim. The empty space in the new win scene has a few buttons(twitter, facebook, Sadale.net and replay) in the real game. And that's it for the Graphic part! The poop sound was made, uh, manually. I voice acted the poop with my mouth xD. 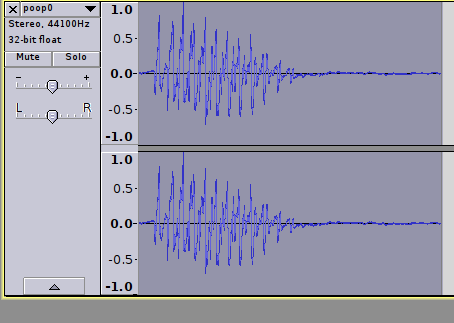 And I used Audacity to do the processing like amplification and removing the silent part of the sound. The poop sounds was recorded by a headset comes with my phone. Maybe I'll buy a better one some day later :P. Four variants of poop sounds were made. Whenever Poopie poops, a random poop sound is played. The siren was made with LMMS(I'm proud to have briefly contributed to the development of this project!). It doesn't sound very good. But still, it just works. And it isn't a very important element of the game. 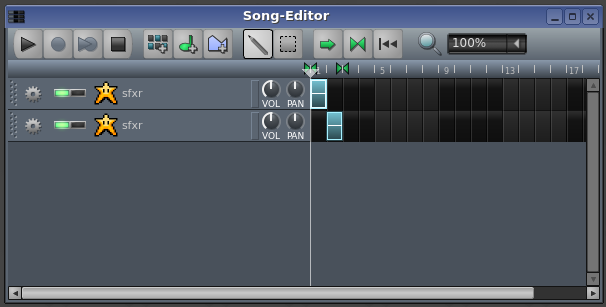 Behold screenshot of making siren sound effect. 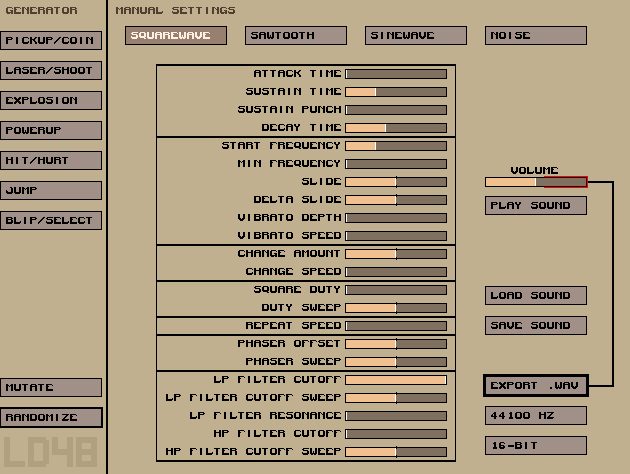 As you see, the siren sound is made with sfxr synth(I ported sfxr to LMMS!). One track for pitch rise. Another track for pitch drop. Combing them and exporting it as seamless audio. Then I get siren sfx. By using the sliders, it's very easy to make the sound effect I want. And that's all about the sound effects! The programming of the game is done by using Java programming language with the engine libgdx. The IDE I used was Eclipse. And the build system I used was Gradle. Libgdx is a pretty good game development engine. 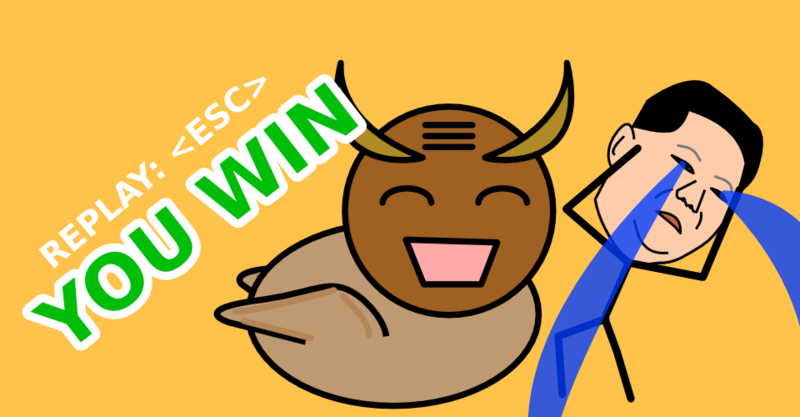 The award-winning Android game I made 大團完(Not released to be public) was the first game I used this engine. And it is the preceder the game Fall in Love. One of the very attractive feature of this engine is that it is capable for exporting games to HTML5, iOS as well as desktop(as a .jar executable). That's why I'm using this engine. Still, one of the flaw of this engine is that its HTML5 support isn't perfect. The main issues that I found was the loading screen. The bright spot in the loading screen was for the logo of libgdx. While I can figure out how to replace the logo, I couldn't figure out how to remove the bright spot at the moment. Another issue is that the sound playback is lazy-loaded. The sound isn't loaded until it's played and it causes delay of sound playback in the first play. There are probably some workaround, tho. I'm just too lazy to find it at the moment :P. Maybe I'll try HaxeFlixel some time later. Mainly because it has better web support(with flash). Interestingly, programming didn't take much time of the development of the game. The time spent on this game is Graphic > Programming > Sound effects. This is my first project that Graphic takes more times than Programming. It's probably because I decided to dedicate more time on the graphic for this game and hopefully it can make the game looks better. The developers of the tools I used. It includes Inkscape, LMMS, Audacity, sfxr and libgdx. PuzzlePieces/Kaitlynn/thedandmom/Experiment073 for the tutorial on drawing wings. I found that wing in Google Image Search. It was a repost of Pinterest and it had taken me a while to track down the original source. My cute little sister for providing consultation on graphic. Mainly on quality control of the graphic and shading techniques. Here's the assets pack of the game. It's released in public domain. You can do whatever you want with this assets pack. While it isn't a requirement, attribution is appreciated. If you like the game or the assets pack, please follow us in Twitter or like us in Facebook! Once again, this game is for entertainment purpose only. No political message intended. No real Kim is harmed during the production of this game. Previously, I've released the web version of Poopie: Making Kim Jong Un Cry. Let's make Kim cry. Go pooping with your Android phone today! Hey guys! I've just released a new game. Poopie: Making Kim Jong Un Cry! It is an enhanced version of my Ludum Dare 33 Entry. FAQ: Why does this game has something to do with Kim? HTML5 version is released. Android version coming soon is now available! After two months of work, early access version of Koloniigo is finally available! A few users has reported that this game is confusing. Therefore, I add a tutorial instruction section here. Click a blue building to send population to it. Turn based game. It's your turn, enemy's turn, your turn, enemy's turn and so on. In each turn, send population from your building(s) to other building(s). When the population a enemy's building drops to 0, it's yours. 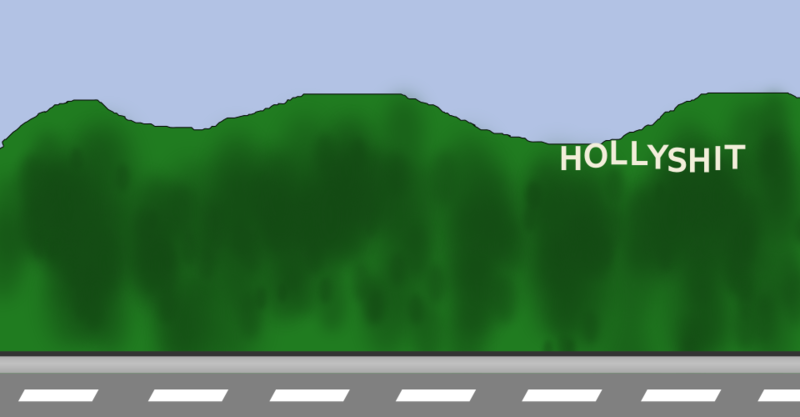 Each building has special function shown in speech bubble, e.g. double defense, triple attack, etc. Q: What are the color bar above the buildings? A: They're the amount of population inside a building. white~red = 0~10; red~orange = 10~20 and so on. Double thickness means 100+, triple thickness means 200+ and so on. Q: What does the icons in the speech bubbles do? Q: I've controlled all of the buildings. Why I still can't win? A: It takes time for population to move from a building to other building. The moving population of opponent is hidden by default(unless you got a beacon). If it happen, it means that there're still moving enemy population in the map. Those moving population might be able to take back the control to your building. That's why you aren't regarded as winning until all moving enemy's population is died out..
Q: How do I beat tutorial 3? A: First, you need to take control of blacksmith(the thing that looks like an oven). Then make use of the blacksmith for attack because it has 3x attack compared with other buildings. Q: The game freezes in networked game. Is the game broken? A: No. If you can do nothing in networked game, it means that your opponent is making decision on his turn. You have to wait for your opponent to click the next turn button. So just wait. Q: I can't send population in networked game.